Speaking to the more than 20,000 people gathered on the campus of Westminster College and thousands more who listened to the speech live in 132 countries around the world, former Soviet President Mikhail Gorbachev closed the curtain on the Cold War with his speech, "The River of Time and the Imperative of Action", on May 6, 1992. 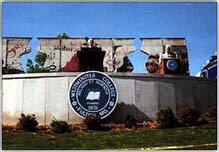 Following an opening processional that included a memorable walk by Gorbachev through one of the openings of the "Breakthrough" sculpture, William Young, College Chaplain, delivered the invocation, and the 39th U.S. Army Band from Fort Leonard Wood played the national anthem. President Saunders and Missouri Governor John Ashcroft offered greetings from the College and the State of Missouri. Next, Yanina Chernenko, a Westminster freshman from the Russian city of Saint Petersburg (formerly Leningrad), presented her former president for the honorary degree of Doctor of Laws. Gorbachev and his 22-member delegation arrived in Columbia, Mo., shortly after noon via The Capitalist Tool, a private Boeing 727 jet owned by the family of the late Malcolm Forbes. After a 40-minute motorcade to Fulton, President J. Harvey Saunders escorted Gorbachev; his wife, Raisa; his daughter, Irina Virgahskaya; and his delegation to a private luncheon held in Westminster's Hunter Activity Center. The former Russian leader also was given a special tour of the Winston Churchill Memorial and Library before delivering his address in the foreground of Edwina Sandys' "Breakthrough" sculpture. 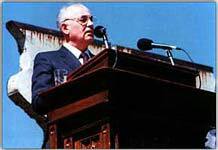 The crowd applauded as Gorbachev moved to the historic podium used by Winston Churchill in 1946. The 45-minute address was delivered in Russian and simultaneously translated into English by U. S. State Department interpreter Harris Coulter. Then, minutes after student body president Christine Bratkowski concluded the event with a benediction, the Gorbachev delegation left Fulton for its return trip to Columbia. 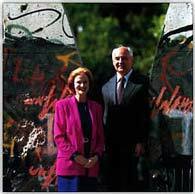 Forty six years, two months and two days after Winston Churchill's monumental speech, Gorbachev had brought Westminster and the world full circle -- proclaiming an end to the Cold War and the beginning of a new era holding the promise of peace. 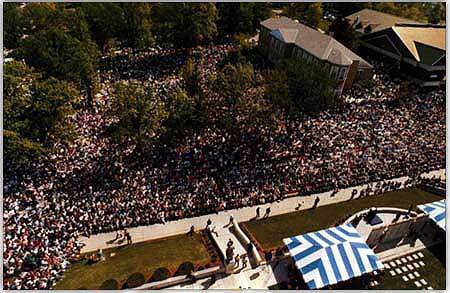 Gorbachev presents his speech in front of "Breakthrough"
An aerial view of the audience, estimated at 20,000 people. Edwina Sandys, granddaughter of Winston Churchill, and Gorbachev stand within "Breakthrough"